A new power generation technology could provide baseload power while reducing CO2 emissions. Many countries have accepted the United Nations Framework Convention on Climate Change (UNFCCC) Paris Agreement on mitigating climate change. The agreement, which came into force on 4 November 2016, seeks to strengthen the global response to the threat of climate change by keeping global temperature rise to less than 2°C above pre-industrial levels this century, and to pursue efforts to limit the temperature increase even further, to 1,5°C. Utilities are already reducing CO2 emissions by closing coal-fired power stations as they become uneconomical due to CO2 penalties and the cost of CO2 capture and storage, while embracing incentivised and subsidised alternative energy sources. This creates a demand for “greener” power generation technologies such as nuclear and renewables, including wind and solar. The world continues to mine fossil fuels such as coal, oil and gas which is then converted to electricity and liquid fuels, with efficiencies of around 35%. Power generation thermodynamic cycles can deliver electricity at 40 to 46% efficiency, but one must deduct from that figure the power used by the power station to run pumps, fans and other process equipment. Transmission losses from where the power is generated to where it is used can also be quite substantial, in the order of 10%, resulting in an effective efficiency of 30 to 35% (the global average is 33%) of the energy in the fuel. The balance is lost as heat. Even gas-fired combined-cycle systems operate with overall efficiencies of between 40 and 50%, with a global average of 44%. We emit CO2 and waste heat into the atmosphere when we generate electricity. If we could use even a small portion of this waste heat to generate power, no additional fuel would be required and no additional CO2 would be emitted. Every kWh of electricity produced from waste heat would therefore save fuel without emitting CO2. The fact that the source of waste heat is in close proximity to electrical generators (cooling water at about 40°C from the power station condensers) in quantities greater than the actual current power station electricity output, would make waste heat recovery from existing coal-fired and even nuclear generation facilities very cost-effective. For new power requirements, we should bear in mind that the earth continuously receives energy from the sun and, after deducting the approximately 30% which is reflected back into space, the heat absorbed by earth is more than 6000 times the global energy we use. Solar thermal energy is readily available everywhere. Heat recovery of low-temperature heat sources, typically below 200°C, such as geothermal and solar thermal have seen the introduction of organic refrigerants as operating mediua, making the Organic Rankine Cycle (ORC) and the Kalina Cycle the current state-of-the-art. The high pressure and density of organic media at such low differential temperatures delivers much more power at higher efficiencies than is possible using water or steam at these low temperatures. Waste heat at temperatures below about 80°C is currently not considered to be economically viable for power conversion, except on small scale and in very specific applications. In Fig. 1, liquid ammonia (NH3), condensed at 20°C, is pumped at an absolute pressure of 1,49 MPa and sent to the boiler’s heat exchanger where the liquid is heated to a saturation temperature of 38°C and then evaporated. This high-pressure NH3 vapour is then expanded isentropically in a turbine (or other suitable expander) to generate power. The turbine exhaust is routed to a condenser, where the vapour is returned to liquid. The temperature of the condenser must be as low as possible to ensure a reasonable heat-to-power conversion efficiency for the thermodynamic cycle, but it depends on the temperature of available cooling water. Obviously, the condenser pressure would be the saturation pressure of the NH3 at the condensing temperature. In Fig. 1 we have assumed that cooling water of 5 to 15°C is circulating to keep the condensing temperature at 20°C and the pressure at 869 kPa (abs). Fig. 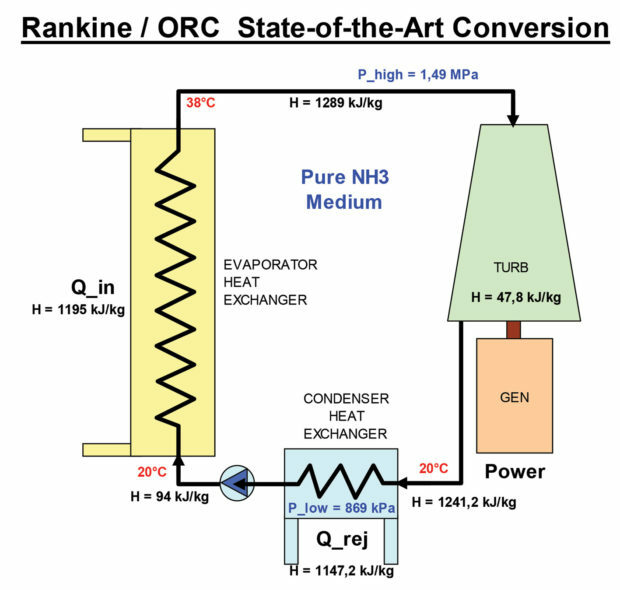 1: Rankine/ORC conversion example. Actual ammonia enthalpy values have been used in Fig. 1, to demonstrate the limiting conversion efficiency of this thermodynamic cycle. We assumed the low turbine isentropic efficiency of 70% to be realistic (well designed turbines might have much higher efficiencies). This demonstrates that the cycle efficiency of 4% is in fact 69% of carnot, due to the low isentropic power conversion efficiency of 70% assumed for the turbine. Even so, this 4% conversion efficiency makes a wasteful installation, as 96% of the heat flowing through the heat exchangers, is discarded as waste. Also, the hot water providing the heat in the inlet heat exchanger need to have a very large mass flow, as the exchanger can only cool it to the pinch temperature (around 38°C) at which the NH3 evaporates. This will make the total installation very expensive per kilowatt of electricity produced. Looking at a Kalina cycle, the benefit of no boiler pinch may deliver a lot more power density, as heat would be absorbed in the input heat exchanger all the way from the initial inlet 48°C to only a few degrees above the cold condenser inlet temperature. The hot water mass flow entering the boiler heat exchanger would be much smaller than for the normal ORC as it is cooled with a much wider differential temperature, so for heat recovery, smaller (cheaper) exchangers are required. The rest of the Kalina cycle is the same as the ORC (Fig. 1), with a conversion efficiency of around 4%, and it would also reject 96% of the supply heat in the condenser. Let’s have a look at an interesting development to illustrate an important fact. Fig. 2 shows the Hygroscopic Cycle, which was patented by Serrano and published in 2010. A test plant was constructed in Spain in April 2015 to demonstrate the viability of the concept. This technology is not really designed for low temperature heat recovery, using traditional steam turbines, but rather for use as a standard utility-scale power generation thermodynamic cycle in very hot, dry climates where dry cooling is necessary. 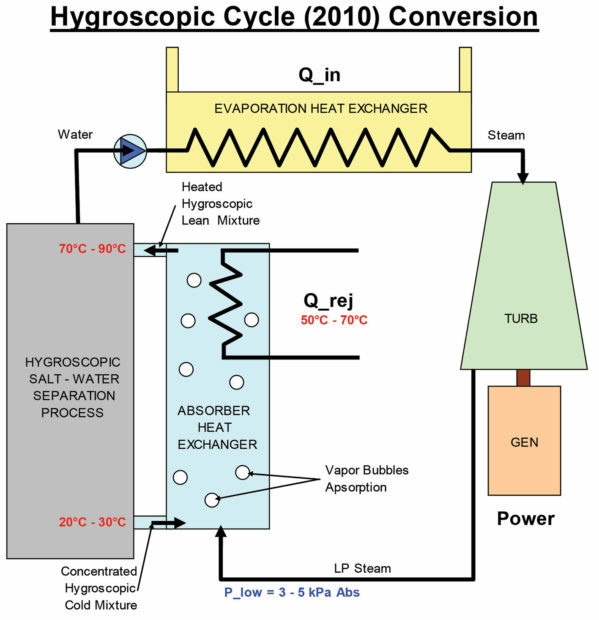 The cycle uses water/steam as the operating medium, but instead of the standard condenser, it uses an absorber containing hygroscopic material to absorb the low-pressure steam from the turbine rather than condensing it. This results, as we have seen in absorption refrigeration and absorption heat transformers, that low-pressure vapour heating the absorber with latent heat as well as the heat of the solution, doesn’t really increase absorber pressure. The absorber pressure reflects the low vapour pressure of the hygroscopic mixture, which is much lower than a conventional condenser’s pressure at the same temperature. A highly concentrated mixture of hygroscopic salts entering the absorber at a low temperature (about 20 to 30°C) is heated at almost constant pressure (about 3 to 5 kPa abs), by the low-pressure vapour entering the absorber, to between 70 and 90°C before exiting the absorber as a heated, lean mixture. This lean mixture is routed through the boiler, where it boils off most of the water, concentrates the hygroscopic mixture again and repeats the cycle. Fig. 2: The hygroscopic cycle. The rest of the thermodynamic cycle is the same as the well-known rankine cycle described earlier, and is similar to most utility power generators. The biggest advantage of this system is that the normal condenser (cold) heat rejection is replaced by the high temperature (70 to 90°C) heat rejection from the absorber. The cooling water may therefore be as high as 60 to 80°C, as long as it is a few degrees colder than the hot absorber temperature, making air cooling or dry cooling very cheap and practical, even in very hot climates, while retaining typical utility-scale power generator efficiencies. This is because the low absolute pressure in the absorber is the same as what the condenser would have been. Similar to the hygroscopic cycle, the Regenerative Heat of Solution (REHOS) cycle uses an absorber instead of a condenser, and the cycle is a true binary cycle derived from absorption refrigeration principles, having different ammonia concentrations in different places in the cycle. In Fig. 3, we used NH3 in aqua (ammonia and water) as the working medium, but obviously other binary combinations may also be used for different operating conditions. The REHOS cycle however, has two unique differences from the hygroscopic cycle. Firstly, the vapour-heated absorber temperature is designed to be high enough to use as boiler/evaporator to produce the high pressure ammonia vapour required to power the turbine. This is possible with a careful mass- and heat-flow balance in the design. This regenerative use of the heating effect of the low pressure turbine exhaust vapour conserves and re-uses all the heat which would have been rejected in a condenser. The cycle therefore has no official heat rejection, (only heat leakages by non-perfect thermal isolation) resulting in a very high thermodynamic efficiency. Secondly, the desorption process (the grey block in Fig. 3) is powered by a heat pump internally, to further increase cycle efficiency. In the hot side of the desorber, the rich (~20%) NH3 in aqua mixture gives off some nearly-pure NH3 vapour, condensed in the cold end of the desorber by the heat pump extracting latent heat from the cold end to add to the desorption hot section, while the lean liquid mixture (~5%) returns to the absorber. Note that the desorption process uses very little energy, as confirmed by the numerous heat and mass balance calculations conducted, using the referenced information. In reality the radiation heat leakage loss and pumping power required by the cycle would decrease the efficiency still further, but can be expected to be between 80 and 90%. The REHOS cycle actually consists of two parallel thermodynamic cycles: the heat extraction part, being an absorption refrigeration cycle; while the power generation part contains the turbine exhaust waste heat recovery into a shared absorber. The external input heat is extracted from a heat exchanger flashing liquefied NH3 to either desorber pressure (at temperatures of 0 to 20°C with a power density of ~160 kW/kg NH3) or absorber pressure, in which case heat may be absorbed from as low as -28°C (giving power density of ~140 kW/kg NH3), as the absorber pressure is around 1 Bar (abs). This make the cycle extremely versatile, as it may even absorb ambient heat from the environment from which to generate power. Fig. 3: The REHOS cycle. As the REHOS cycle consists of three heat exchangers and two pumps coupled to a turbine or other expander, e.g. Lysholm Screw, scroll or other dense fluid positive displacement expander, it is not difficult to see that the capital investment required for the REHOS installation (even for a small 10 kW unit) would easily match the cost of a utility-scale solar PV installation per installed kWe; but the REHOS generates power from waste heat, which is available anywhere and any time, so it produces baseload power with a capacity factor of 92%, matching a typical nuclear baseload power generator, at the same capital cost, delivering electricity at a levelised cost of electricity (LCOE) of <R0,82/kWh. The high thermodynamic conversion efficiency (80 to 90%) and low capital investment requirements would guarantee generation cost below the current average grid parity, making it the cheapest baseload power generator technology ever, able to operate 60% cheaper than nuclear. It can be modular and scalable from a few kW to several MW making implementation very practical. Although numerous different experimental REHOS cycles have been analysed with heat balance, mass and percentage of NH3 balance calculations, we have embarked on the design and construction of a proof-of-concept model which we plan to complete this year. Extracting heat from the cooling water of existing power stations has the advantage of increasing a power station’s generating capacity by 100% (as most power stations reject more heat in the condenser than the power they produce) without interrupting the existing power station’s operation. REHOS modules could be added as and when required to gradually allow the station to operate on lower main steam pressures to extend its life resulting from lower stresses in the boiler’s pressure parts. Also, a lower condenser pressure increases the power station’s capacity. Reclaiming the waste heat from the cooling water would leave less heat to be dissipated by evaporation (wet cooling generators) meaning that the power station would use less water. Each additional REHOS module would reduce the power station’s CO2 emissions and reduce its use of water, allowing an old power station to be de-rated to conserve operational life. Adding a REHOS cycle as bottoming cycle to existing fossil (and nuclear) power generators would change the power station’s efficiency to ~60% from the original 33%, while the station’s CO2 emissions are halved. This would also be the case for solar thermal power generation, as these also use the rankine power block and reject about 60% of the heat collected from the sun in cooling towers. Newly-built power generators may want to extract environmental heat (supplied by the sun) in high density water media (to keep heat exchangers small and cheap) such as pools, rivers, dams, lakes and the sea, where the REHOS cycle power may be used. 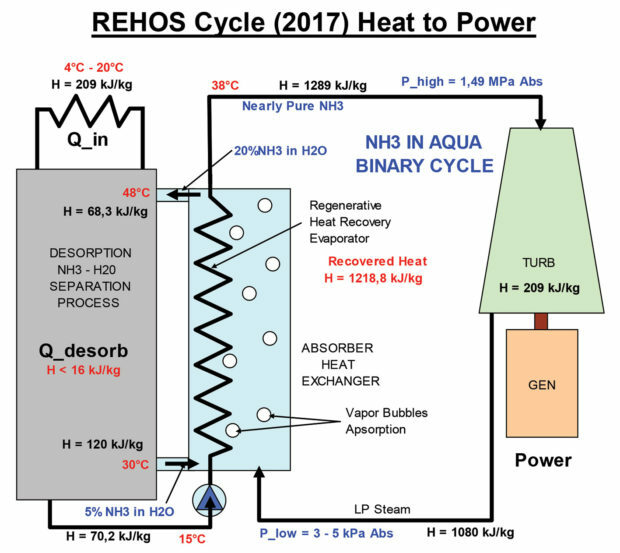 Using a REHOS cycle to power water pumps by extracting waste heat in the water being pumped, makes water pumping essentially free. The energy requirement for water desalination by reverse osmosis is almost entirely for pumping purposes. The use of this REHOS cycle is limited only by our imagination, and wherever it is used, it can replace CO2-emitters and produce cheap, emission-free electricity. Large-scale roll-out of REHOS cycles are very likely, driven by economic pressures and would help governments to achieve the ambitious goals set for CO2 reductions as set out in COP21 Paris Agreement. It would also stimulate economies by decreasing the cost of electricity. This would stimulate job creation and economic expansion in ways we can barely imagine. Dr. Manuel R Conde-Petit: “Thermophysical Properties of NH3 + H2O solutions for the industrial design of absorption refrigeration equipment”, M Conde Engineering, Zurich, 2004. N Shankar Ganesh and T Srinivas: “Evaluation of thermodynamic properties of ammonia-water mixture up to 100 bar for power application systems”, Vellore Institute of Technology, India, 2011. Sirisha Devi Govindaraju: “Analysis of Absorber Operations for the 5 kW Ammonia/Water Combined Cycle”, Thesis presented to the Graduate School of the University of Florida in partial fulfillment of the requirements for the MSc degree, 2005. JH Keenan, FG Keeyes, PG Hill and JG Moore: “Thermodynamic Properties of Water including Vapour, Liquid and Solid Phases”, John Wiley & Sons, 1969. Lester Haar and John S Gallager: “Thermodynamic Properties of Ammonia”, published in J Phys. Chem. Ref. Data, Vol. 7, No. 3, 1978. W Rivera: “Experimental Evaluation of a Single-Stage Heat Transformer used to Increase Solar Pond’s Temperature”, Solar Energy, 2000. C Knowlen, J Williams, AT Mattick, H Deparis and A Hertzberg: “Quasi-Isothermal Expansion Engines for Liquid Nitrogen Automotive Propulsion”, University of Washington, 2011. CH Mostofizadeh and C Kulick: “Use of a new type of heat transformer in process industry”, Institute for Energy and Process Engineering, Applied Thermal Engineering, 1998. Mathew Determan and Srinivas Garimella: “Ammonia-water desorption heat and mass transfer in micro channel devices”, Sustainable Thermal Systems Laboratory, George W Woodruff School of Mechanical Engineering, Georgia Institute of Technology; International Journal of Refrigeration, 2011. Juan Carlos Abrego Castillo: “Cost Estimation of using an Absorption Refrigeration System with Geothermal Energy for Industrial Applications”, Report No. 4, 2007 for Geothermal Training Programme of the United Nations University in Reykjavik, Iceland. Sanne Lemmens: “Cost Engineering Techniques and their Applicability for Cost Estimation of Organic Rankine Cycle Systems”, Department Engineering Management, University of Antwerp, Energies 2016. Terence Creamer: “Beyond Redundancy – Grid-scale storage is critical “missing piece” in electricity market”, Engineering News, April, 2017. Chris Yelland: “Understanding the cost of electricity from Medupi, Kusile and IPP’s”, Energize, August 2016. Chris Yelland: “Assumptions of the cost of electricity from a new-nuclear build in SA”, Energize, August 2016. US Energy Information Administration: “International Energy Outlook 2016”, May, 2016. The post Baseload power from waste heat appeared first on EE Publishers.